The largest of the Polynesian archipelagoes which includes 76 islands and atolls spread out over more than 20,000 km2 slumbered for many years, but now has come back to life through the establishment of some 250 pearl farms and tourism based around the rich scuba diving sites, which make it a winning destination. The very basic houses of the Tuamotu islands are charming with their typically whitewashed walls. 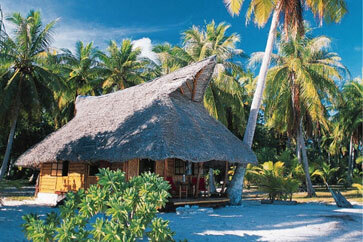 The islanders cutely and tastefully decorate their rooms with “tifaifai” cushions, shell necklaces and shell art work. Close by, it is not unusual to see the family fish park, a real pantry where shoals of cavally, “duckbills” and parrotfish are swimming around. Children can choose a playmate from amongst the small sleeping sharks. On the surface of the vast inside lagoon of the atolls you can often see the outlines of little jetties and pearl farm structures which are usually included in sightseeing tours for visitors curious to see how they work and to admire their pearls. Being far way does not mean isolation and lack of comfort. “Green” solar energy provides electricity and hot water and all the modern means of communication are available in these atolls. On the other hand, water remains a precious commodity and every method of collecting it is employed, rain water storage tanks in particular. 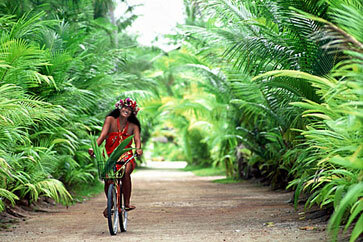 Far from the bustling city, the Tuamotu offer a life-style that the Robinson Crusoe in all of us only dreams of. Stepping right outside your normal home environment yet in harmony with nature’s great ocean, between the sky and the sea, you soon learn how to live beyond the normal constraints of time. 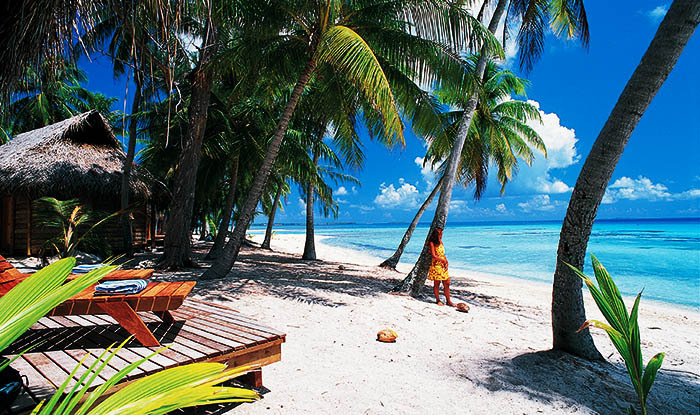 Any remaining South Seas expectations will be fulfilled by the Tuamotu Islands, which are spread over hundreds of square miles in the eastern Pacific; with snow white beaches of coral lined with swaying palm trees, lagoons rich in color with crystal-clear water and abundant tropical marine life. While the life of the natives may seem tranquil, it isn’t necessarily easy: the meager vegetation of the islands puts serious limits on income opportunities. Copra production and fishing are basically the only games in town, and for the past few years, special farms have started cultivating seeded pearls. 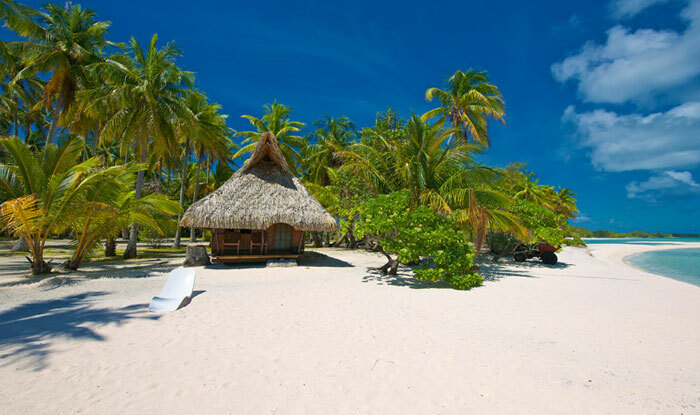 Only Rangiroa and Manihi have hotels, on other islands accommodations consist of either little bed & breakfasts or some other form of private rooming. In Rangiroa, 199 miles (320 km) from Tahiti, the world’s second-largest atoll, the huge turquoise lagoon (41 miles/67 km long and 16 miles/26 km wide) radiates nature in its most complete beauty. The two towns of Avatoru and Tiputa guard the entrances to the lagoon, which are deep enough for large ships. The little hotel complex of Kia Ora Sauvage is a special treat. A solid hour away from civilization by boat, it allows its guests to spend a modern Robinson Crusoe vacation on a small motu. Manihi, with its unique underwater world, is about 320 miles (about 520 km) northwest of Tahiti. Copra and seeded pearls guarantee the local inhabitants’ income. 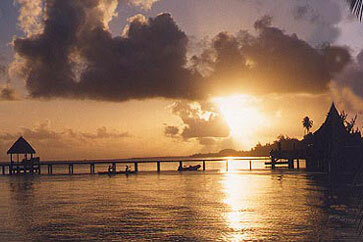 The town of Turipaoa was built at the entrance to the over 12-mile-long and 6-mile-wide lagoon (20 by 10 km). TheÂ Manihi Pearl Beach Resort provides a very special service: guests who are staying in the luxurious overwater bungalows are served meals by Polynesian beauties in dugout canoes. 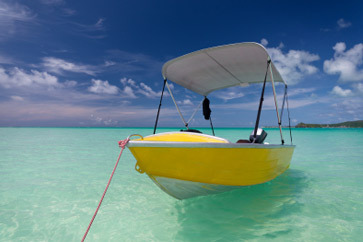 To sum up: A visit to one of the Tuamotu Islands is the promise of stress-free vacationing, a terrific idea for those in search of peace and quiet; and for water sports enthusiasts there is diving, snorkeling, swimming, fishing, taking boat rides, walking and picnics on the beach. The annoying nono fly, whose sting can itch for days on end, can be avoided by using a good insect repellent. We know the Tuamotu’s and visit frequently: Our renowned Virtuoso Tahiti Travel Specialists are your trusted advocate, with integrity, and person to person professional service. Get started with our Tahiti vacation planner, you’ll get free upgrades, special touches, luxury amenities and unbeatable airfare. We do it all for you, air, car, hotel, transfers, everything you wish.